Critics and scholars may differ, but what do they know. With two national nominating conventions looming, it is time to single out the best film ever made about politics. I have my selection, you will have your own. Your choice may be better than mine. If you want to agree or disagree with my choice, write to wall writings.me, and voice your opinion. I won’t argue with you but I will learn from what you write. When the two conventions are held in the next two weeks in Denver (Democrats) and Minneapolis (Republicans), the dramas will be shown on television. If you don’t have cable in your home, the major non-cable US networks will limit your viewing to one hour per night, leaving you plenty of time to view films that delve into the manner in which citizens actually choose their leaders. Of course, if you have cable, and you feel strongly in favor of one of the two parties, then turn to pro-Democratic MSNBC, or pro-Republican Fox, for gavel to gavel coverage. Or you may want to check in on CNN and let political reporter Wolf Blitzer tell you which party has been nice to Israel, lately, something that is terribly important to the former AIPAC staffer, the Wolfster man. Whatever your attitude toward the two parties, there will be some serious time available for major DVD viewing time. And if your library is as good as mine, it will have a good selection of current and classic films. I judge films not on their genre nor their entertainment success, but on their significance as works of film art. Looking at the options for the best political film ever made, Citizen Kane is often viewed as the best film of any genre, ever made, a legitimate claim. It is, indeed, about the political rise and fall of an ambitious man who moves from journalism to politics, assumed to be based on William Randolph Hearst. Orson Welles directed, wrote and starred in a story about lust for power. But I don’t view it as a political film because politics is the stage on which Charles Foster Kane’s career rises and falls. The dynamics of politics itself, is not the film’s focus. The best ever political film list has to include the 1949 film, All the King’s Men, a fictionalized version of Louisiana’s Governor Huey Long. In the original novel by Robert Penn Warren and in the film, Long is Willy Stark. He is played by Broderick Crawford in Crawford’s finest performance over a long film and television career. Crawford serves as a (uncredited) narrator in another good, though not great, 1972 political satire,The Candidate, which starred a boyish looking blond Senate candidate, Robert Redford. Closer to the top of my list is John Ford’s 1958 film, The Last Hurrah, the story of big city Irish American mayor Frank Skeffington (Spencer Tracy) who seems to float above the ugliness of his final campaign for his reelection. It is clear that Ford sees him as the quintessential political boss, part rogue, part tough guy, and always pragmatically oriented to every important wake in the city. The film is based on Edwin O’Connor’s 1956 novel “The Last Hurrah”, is a fictionalized version of former Boston Mayor M. Curley. Tracy invites a nephew who is also a journalist, to travel with him through the campaign, and we are meant to see the campaign through the nephew’s eyes. When he loses, Skeffington consoles his nephew with the understated, “sorry I could not provide you with a better ending”. Tracy as the mayor is superb. His opponents, however, are all stereotypes and the nephew is bland. My favorite character, after Tracy, however, is one of those loyal Ford sidekicks, “Ditto” Boland (Edward Brophy) whose disappointment at the defeat leaves him furiously jumping up and down on his hat. The runner up as the best film ever made on politics is The Best Man (1964), written by Gore Vidal from his own original stage play. Directed by Franklin J. Schaffner, the film centers on backstage dramas that unfold during a party’s nominating convention. William Russell (Henry Fonda) is the idealistic liberal candidate whose main opponent is a political hack, Joe Cantwell (Cliff Robertson), who is troubled by neither idealism nor values. Both candidates hold smear cards against the other, ready to be played. The cards are familiar to us today: homosexuality (rarely mentioned this overtly in films in the early 60s), a pending divorce, and mental episodes from the past. Will they be used and who will use them? Power is not a toy we give to good children. It is a weapon. And the strong man takes it and uses it. If you don’t go down there and beat Joe Cantwell to the floor with this very dirty stick, then you’ve got no business in the big league. Because if you don’t fight, the job is not for you. And it never will be. 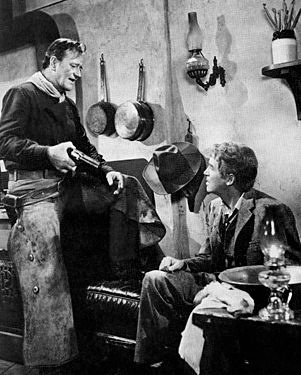 Hockstader would be right at home in what is for me the best film about American politics ever made, John Ford’s The Man Who Shot Liberty Valance. The two stars of that 1962 release are John Wayne and Jimmy Stewart, pictured above at the top of this posting. This picture is always viewed as one of Ford’s westerns, which it is, but the deeper significance of what was in my mind, Ford’s best western (even better than The Searchers), is its insights into the American political process. At the center of the film is the conflict between the traditional story of the early American west, where the white invaders often confronted one another in gun fights in places like the OK Corral. Liberty Valance (an over the top performance by Lee Marvin) is the embodiment of absolute evil, a killer who uses fear as an instrument of control. The film is told in a flashback: A US senator named Ransom Stoddard (Stewart) returns to the town of Shinbone to attend a funeral of an old friend, Tom Doniphon (Wayne). The local newspaper reporter and his editor insist that the senator explain why this funeral is so important to him. He agrees to do so and the flashback begins from the moment of Stoddard’s arrival outside Shinbone when he first encounters Liberty Valance in a holdup. Stoddard is from “the east” and he has come to this western frontier town to set up a law practice. He meets Hallie Stoddard (Vera Miles), a local beauty, when she treats his wounds from the holdup. He also meets Tom Doniphon who is courting Hallie and who is the only local willing to stand up to Valance. The town is in need of a savior from Valance’s control. Doniphon cannot do it alone and Stoddard is not ready, with his law books still unpacked, to be that savior. But together, in the film’s pivotal moment, they rid Shinbone of Valance in a gun fight in a darkened street. Everyone assumes Stoddard killed Valance in self-defense. Doniphon knows better, but he lets Stoddard take the credit, and as an added benefit, marry Hallie. When he returns for Doniphon’s funeral, Stoddard decides to tell the truth to the local reporter and his editor. The two journalists listen and the reporter writes it all down. At the end of Stoddard’s story, the editor, Maxwell Scot (Carleton Young), tears up the notes. Maxwell Scott: “No sir. This is the west, sir. When the legend becomes fact, print the legend”. The funeral over, Stoddard and his wife catch the first leg of the train trip back to Washington. A political career built on a lie remans unscathed. When the legend becomes fact, the legend is printed and it becomes the fact. This is a rich film, an old fashioned western, a love story and a story of a lost love, a favorite Ford theme. But it is also a story of politics and how sometimes goodness makes its ambiguous way into the future, there to look for even more creative ways to address the truth, ambiguity and all. The Man Who Shot Liberty Valance demands that viewers remember it as a work of political art. After all, “I give you the man who. . .” is a phrase that has rung through the rafters of political conventions since the time of Senator Ransom Stoddard’s rise to the heights of political glory. Like many others before and since, he is doomed to live out his life hearing the words the train conductor speaks when he tells Ransom and Hallie that the train will make up time and connect with the express train to Washington. Punching their tickets, the conductor proudly proclaims, “After all, nothing is too good for the man who shot Liberty Valance.” Nothing, that is but the truth. Which is why one of John Ford’s final pictures is the best film ever made about politics. Great choice for the top spot. I’ve added The Best Man to my list to watch soon. My favorite political film, for all its feel-good ideologies, is Capra’s MEET JOHN DOE. I think it has more to say within the context of today’s political process than in 1941. Then, more recently, John Cusack’s satire WAR. INC pointed clearly to how the political economy continues to usurp he democratic process. Consumerism is politics and a Christian critique of capitalism is a good thing.